Gretchen Briscoe Muchnick joined F.C. 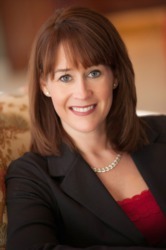 Tucker Emge Realtors in 2006 and currently serves as the vice president of marketing. Her history with F.C. Tucker Emge Realtors goes back to her days in high school, when she served as a weekend receptionist. From the beginning, Gretchen learned the “all-in” approach to the family business! When Gretchen and her husband, Marc, returned to Evansville in 2006, she gradually assumed responsibility for the company’s marketing and branding efforts. During her tenure, the company has launched the new and improved FCTuckerEmge.com, which is the area’s top rated real estate website. In addition, Gretchen oversees several marketing tools for real estate agents, the company’s Information Technology department and leads strategic planning.